Next to genetic talent, years of consistent injury-free training and good nutrition, it appears that the difference between the winner and loser is Technology and Pharmacology. I’ll skip the Pharmacology part for now, as that would take up an entire Blog. As we see more and more world records fall on both able bodied Olympics and Paralympics, you have to ask yourself what percentage of the improvement is technology? Remember the Speedo LZR suits from the swimming events in Beijing? In Track and Field, especially the sprints, we measure what we can measure. And that is the wind and altitude. Anything less than +2.0 m/s wind and 1000m of elevation doesn’t have an * asterisk. But does it end there? Some people claim the MondoTrack is producing faster than expected results (i.e. look at all the SB, PB and WR in the sprints, especially in the 4x100m relay). I’ll save the MondoTrack discussion for a series of articles at a later date. If you watched the 2012 London Paralympics, you probably know the story of Oscar Pistorius trying for the 100-200-400m trifecta. But his 200m gold was “ruined” by Brazilian 200m sprinter Alan Oliveira who was 8 meters behind at the the 100m mark. Oliveira won in 21.45 seconds, storming down the home straight to win by 0.07 seconds. 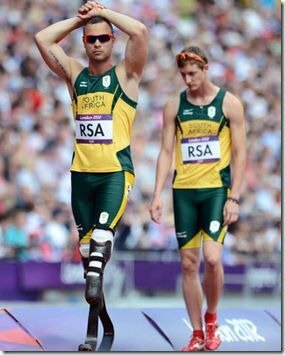 Oscar Pistorius claimed Alan Oliveira’s prosthetics were longer than normal. Take a look at the photos below, and you can make your own assessment. There are longer but the rules are the rules. As far as I have watched and heard about the rules Alan Oliveria was within the rules and that is that. Considering the amount of controversy that has followed Oscar over the years I think he would understand about rules and be a display a little more sportsmanship. Would it have been as much of an issue if he had not been beaten. It is something that he needs to take up with the IPC. As for the apology I think he should not have bothered as it didn’t really seem like an apology. 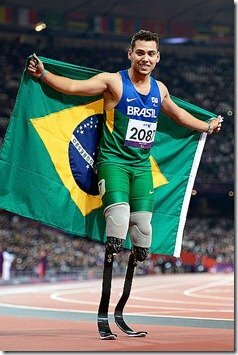 In regards to the technology I think Oscar could have longer blades if he wanted to but then they may not be approved by the IAAF meaning that he would not be allowed to compete at abled bodied competitions (from what I have read). All other things being equal which they normally not then yes technology will have the biggest part to play and the individual with the best prosthetics is likely to have the advantage. @John, yes, there are the IPC rules and the IAAF rules. As I have said before, he shouldn’t have the luxury of competing in both. I don’t think it is a luxury. It was a hard-earned right that was fought for both in terms of the scientific and legal battle, as well as in terms of very hard training on the track. Oscar is the one being consistent in his mission to see the playing field levelled and for Paralympians to have the chance to compete against the best in the world in their event, provided they can achieve the standards fairly. Which is why he wants it to be known that prosthetics need to mimic as closely as possible the missing limbs, without adding any further advantage. I think it is very clear from the video that his running style is far more “natural” than any of those on the longer blades. Those who argue he should not be allowed to compete in both are at once questioning the IAAF ruling, while denying Oscar his right to question the IPC rules on the longer blades. Now THAT is ironic! Those who advocate separation are contributing to a world in which Paralympians will ever-more be regarded as some kind of a freak-show. 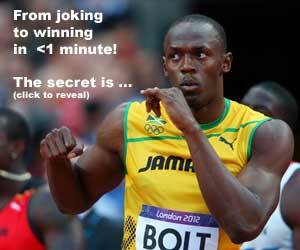 Particularly when we have sprinters on stilts running 18 seconds for the 200m! So Oscar got emotional and had a momentary lapse of sportsmanship. Let’s stay focused on the facts of the matter instead of leaping on the sore loser bandwagon at the cost of the truth! And the problem is? Funny how people get beat and cry foul. There is no advantage according is his camp when racing against able bodied athletes. Now he is saying after a certain length they become advantageous? @adarian, so true and ironic. Let’s see the how the 400 and 100 develops. The schedule was 200-400-100. @Jimson and @ adarian – I’m quite surprised that you would take this view Jimson. It’s not ironic at all because it is a different argument altogether! When Oscar was campaigning to run in able-bodied events he was striving to prove that blades in proportion to his natural dimensions give no nett advantage. So he is admitting that if they were longer they would be unfair. So he is being CONSISTENT, not ironic when arguing that longer/disproportionate blades are unfair in paralympic competitions. We can agree to disagree about whether he should be allowed to compete in both types of events, but we should not allow the emotional content to cloud the distinct arguments. guardian article on this matter. There is a break down on the number of strides each athlete takes. @John, excellent! Sprinting is about stride length vs stride frequency! Pistorius took 92 steps during the race (2.2m per stride), and Oliveira took 98 steps to win gold (2m per stride). To break it down further: in the first 100m, Pistorius took 49 steps (2.0m per stride), with 43 steps in the straight (2.3m per stride). Oliveira, on the other hand, took shorter strides: 52 in the first 100m (1.92m each) and 46 in the second 100m (2.2m each). Perhaps making yourself “taller” does allow you to “shuffle” faster, being that at a given stride length, the angle to the vertical of your centre of gravity as your leg hits the ground is narrower, allowing you to turnover your strides a bit quicker, at that stride length. So perhaps there is a relationship between how tall the prosthetic makes you and the stride rate you can then produce at a given stride length. Which also suggests that there may be some kind of “sweetspot” for each athlete, and if they adjust their blades accordingly, they can go really fast. Warrants a scientific study. @ Damien – a very interesting point, well made. 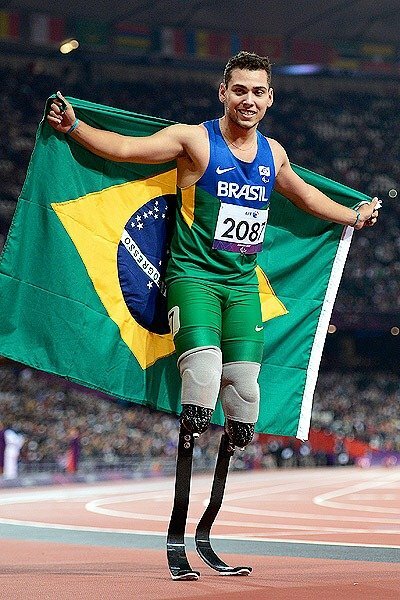 It is not inconceivable that if Oscar lengthens his blades for Paralympic purposes, his 400m times may begin to challenge the able-bodied records. Assuming of course that he can find a sweet spot and adapt to longer blades. Of course his times would not count towards able-bodied competitions any longer. But we may be seeing the dawning of an age where Paralympian sprints run faster than their able-bodied counterparts! I think Oscar should be lauded for not wanting to see this achieved through manipulation of technology only. Jim I agree with you that Oscar shouldn’t have the luxury to compete in both. I think that the argument of technology will spring up in the future if/when amputee athletes start to run times close to the top sprinters in the world.